A pretty design of sprays of greenery and berries is printed on flexible and translucent PVC. 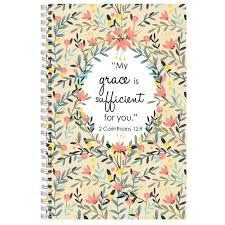 Text on the front cover is My grace is sufficient for you. 2 Corinthians 12:9 while each ruled notebook page carries Scripture from Psalm 118:29, Give thanks to the Lord, for He is good; His love endures forever.